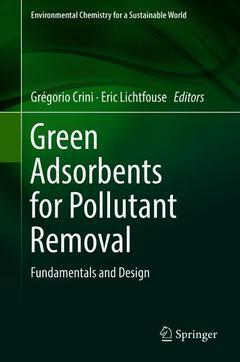 This is the first volume on adsorption using green adsorbents and is written by international contributors who are the leading experts in the adsorption field. The first volume provides an overview of fundamentals and design of adsorption processes. For people who are new to the field, the book starts by two overview chapters presenting the principles and properties of wastewater treatment and adsorption processes. The book also provides a comprehensive source of knowledge on acid-base properties of biosorbents. It discusses fractal-like kinetic models for fluid-solid adsorption, reports on the chemical characterization of oxidized activated carbons for metal removal, and the use of magnetic biosorbents in water treatment. Furthermore, the thermodynamic properties of metals adsorption by green adsorbents, and biosorption of polycyclic aromatic hydrocarbons and organic pollutants are reviewed, and finally the recent trends and impact of nanomaterials as green adsorbent and potential catalysts for environmental applications are summarized. The audience for this book includes students, environmentalists, engineers, water scientists, civil and industrial personnel who wish to specialize in adsorption technology. Academically, this book will be of use to students in chemical and environmental engineering who wish to learn about adsorption and its fundamentals. It has also been compiled for practicing engineers who wish to know about recent developments on adsorbent materials in order to promote further research toward improving and developing newer adsorbents and processes for the efficient removal of pollutants from industrial effluents. It is hoped that the book will serve as a readable and useful presentation not only for undergraduate and postgraduate students but also for the water scientists and engineers and as a convenient reference handbook in the form of numerous recent examples and appended information. 1. Wastewater treatment: An overview.- 2. Adsorption-oriented processes using conventional and non-conventional adsorbents for wastewater treatment.- 3. A systematic analysis and review of the fundamental acid-base properties of biosorbents.- 4. Fractal-like kinetic models for fluid-solid adsorption.- 5. Carbonaceous porous materials for the adsorption of heavy metals: Chemical characterization of oxidized activated carbons.- 6. Thermodynamic properties of heavy metal ions adsorption by green adsorbents.- 7. Biosorption and biodegradation of polycyclic aromatic hydrocarbons (PAHs) by microalgae.- 8. Adsorption and oxidation techniques to remove organic pollutants from water.- 9. Surface engineered magnetic biosorbents for water treatment.- 10. Remediation of polycyclic aromatic hydrocarbons using nanomaterials. Eric Lichtfouse, 58, is a biogeochemist at the University of Aix-Marseille, CEREGE, Aix-en-Provence, France. He got a PhD in organic geochemistry at the University of Strasbourg in 1989 for the discovery of new fossil steroids in sediments and petroleum. He has invented the 13C-dating method allowing to measure the dynamics of soil organic molecules. He is Chief Editor of the journal Environmental Chemistry Letters and former Chief Editor of the journal Agronomy for Sustainable Development. He has published the book Scientific Writing for Impact Factor Journal, describing the micro-article, a new tool to identify the novelty of experimental results. He has published 85 research papers, with an h index of 23, and edited more than 50 books. He got the Analytical Chemistry Prize of the French Chemical Society, the Grand University Prize of Nancy University and a Journal Citation Award by the Essential Science Indicators.